NLP is a state of the art set of communications methods for enhancing personal and professional development and for creating personal change gracefully. NLP is also described as “software for your brain”, allowing you to automatically tap into the kind of experiences you want to have. It is so important in the business community world-wide that elements of NLP are taught in every business training from sales to management to communication. Element of NLP are showing up in many therapeutic models. It is the most significant compilation of human communication in the last 50 years according to Science Digest. It came out of studies of what highly successful communicators and field experts do to accomplish what they want to accomplish. NLP is reproducing excellence. To do that you have to know what excellence is. NLP is not some secret technique. Everyone does NLP all the time. If you talk to someone you are doing NLP. When you have a connection with someone, you are doing NLP. NLP is about being aware of what you are doing and what results you are getting. If you aren’t getting what you want then studying NLP gives you options or choices that have worked for highly successful people. You don’t have to try to change what you doing with trial and error and then not know what you did or how to reproduce it. It is taught in almost every country in the world and close to 750 books have been written on the subject. NLP is outcome or goal based. It doesn’t problem solve. It helps and teaches a person use the way their brain uses information from our 5 physical senses (sight, hearing, feelings, sensations, emotions, taste and smell) to achieve what they want. Most people spend more time learning to use a food processor than they do their own brains. And yet our minds are the one thing that most affects everything else in our lives. It provides a methodology for understanding others as well as ourselves. It is not about getting people to do what you want them to do. It is about fostering mutual respect, tolerance and understanding between you and the people that you communicate with. It is not about reading and interpreting others. It is not about labeling body language. It is about avoiding mind reading and allowing a person to be who they are. And using the non verbal communication as a way of gathering objective information. It is the user’s manual for the brain. It makes people more aware of what really going on. With time and the correct application of the NLP processes and language a person can change things that most people consider unchangeable: serious illness and disease, predisposition to drugs and alcohol, changing bad habits to good ones, changing negative beliefs to positive ones, increasing income, happiness, healing or managing skillfully impossible relationships, self esteem and self image, mental illness. It is about understanding how language influences our mind and as a result, our thoughts and our behaviors. You have to do training in NLP similar to how you learned to drive a car or ride a bike. You can read about NLP in a book but doing a live training with a competent NLP trainer is the most effective way to guarantee you will get long lasting benefits. NLP is taught experientially with demonstrations and exercises. Class sizes are small: between 10-20 people. If you have never taken NLP and not certain about what it can do, the best place to start is a Level 1 class: Building Powerful Relationships. This class has the significant foundational patterns of NLP: outcomes, rapport, calibration, predicates, and anchoring. 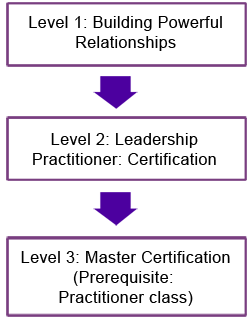 Leadership Practitioner (NLP Practitioner Certification): This training has Level 1 incorporated into the training as well as Level 2. Level 3: NLP Master Certification – the master certification integrates all levels of NLP into your behavior and adds another layer of skill with language and teaches the art of belief change. Q. What can NLP do? A. It lets you model, or copy human excellence in any form. With NLP, you can identify what makes someone exceptionally skilled, and get that skill for yourself or teach it to others. NLP can help you become adept in whatever is important to you, whether that means getting along with your family and co-workers or being more effective on the job. A. NLP is valuable wherever human communication skills can enhance results, in business consultation, management, negotiation, education, counseling, therapy, relationships, parenting, nursing, public speaking, sports performance and many other areas. Q. What kind of results can I get with NLP? A. NLP can allow: a salesperson to significantly increase their business, a therapist to change the impact of the past on a client, a teacher to change a poor speller into a good speller, a business person to gain rapport nonverbally and to run meetings efficiently, an athlete to improve concentration, and more. The results you get depend on the specific application, and with NLP there are many. Q. Will NLP change the way I think? A. Yes. This is one of the things NLP does best. You can experience it for yourself in a seminar. NLP helps people transform debilitating emotions into empowering, resourceful feelings. Since many therapies are very slow, based on catharsis or venting your feelings, many people associate personal change with the expression of a lot of unpleasant feelings. NLP offers a much more pleasant, effective way of dealing with emotions. We assist people in going through old memories in new ways, quickly transforming unpleasant experiences into positive resources. We do not get into your personal content. Q. Can you use NLP on yourself? A. Yes. You can use some NLP patterns with yourself immediately. This includes: changing your feelings, learning a new thinking strategy, changing habits, motivating yourself and more. Other patterns/techniques are primarily useful in working with others. A. Since NLP is so powerful in getting results people want to know that it will be used to benefit them. Our trainings emphasize ways to ensure the changes you make are in your best interest. Knowing NLP gives you ways to protect yourself from manipulation by others and the media. Q. Can I get the results I want by reading a book, or is it better to attend a seminar? A. NLP books are an economical way to find out more about NLP. Attending a seminar allows you to install the technology into behavior. A training is the easiest way to have NLP skills become a natural part of your behavior as they allow you to observe live demonstrations, practice in an encouraging environment, get individual feedback and make personal changes along the way. Q. What is the relationship between NLP and The Silva Method? A. NLP is very left-brain and actually mathematical; Silva is a right brain process. Together when used by one individual, it promotes WHOLE BRAIN THINKING. There are some situations where Silva works best and other situations where NLP works best. Having both set of tools allows a person to expand their use of the brain and methods of problem-solving and change management.